I see that the NAR has hired Crackhead Bob as their new headline writer, to wit: Existing-Home Sales to Stablize Before Upturn in Second Half of 2008. "The Pending Home Sales Index, a forward-looking indicator based on contracts signed in February, slipped 1.9 percent to 84.6 from an upwardly revised reading of 86.2 in January, and was 21.4 percent lower than the February 2007 index of 107.6. “The slip in pending home sales implies we’re not out of the woods yet, though an era of successive deep sales declines appears to be over,” Yun said. This is the lowest level reported since the index began in 2001. I'm not sure if they are being clueless or willfully deceptive. Again, you have to be a drug abuser to believe a 21.4% drop in the year-over-year index is a sign of stability. Now, back to the NAR forecast of "Stability" in the first half and improvement in the second half. Have a look at the chart below. 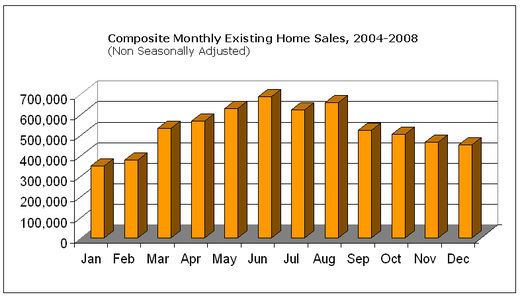 As we discussed last month, home buying is extremely seasonal; that's why month to month changes are all but meaningless. The first 6 months of the year all show gradual improvements; July and August represent a plateau of sorts, with the sales dropping for the last four months of the year. My best guess as to why this is: Most families want to move into their new home before the new school year starts, so as to minimize disruption for the kids. Note that this data is not seasonally adjusted. Nice Howard Stern reference!! I actually reread the headline using his (CHB's) voice - good stuff. Please find a way to work in "Hank the Angry (drunken) Dwarf" in next!